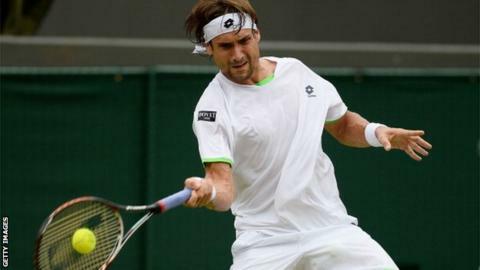 David Ferrer is one of five world top-20 players to confirm they will be competing at the new ATP World Tour event in Nottingham in June. The former world number three is a two-time Wimbledon quarter-finalist and reached the 2013 French Open final. Now ranked eighth in the world, the Spaniard has already won three titles this year and joins compatriot Feliciano Lopez on the entry list. David Goffin, Frenchmen Jo-Wilfried Tsonga and Gilles Simon will also play. Aljaz Bedene, who gained British citizenship last month, is the second Briton on the list after James Ward announced his participation in March. Nick Kyrgios, who beat Rafael Nadal in the fourth round at Wimbledon last year, will return after winning the 2014 Nottingham Challenge title. The tournament begins on 22 June, the week before Wimbledon. The former Nottingham Open, a men's tournament held at the city's tennis centre, folded in 2008 after 14 years as a warm-up event for the sport's only Grand Slam to be played on grass. Meanwhile, it was announced in December that the East Midlands venue will also stage a WTA women's tournament from 8-14 June.